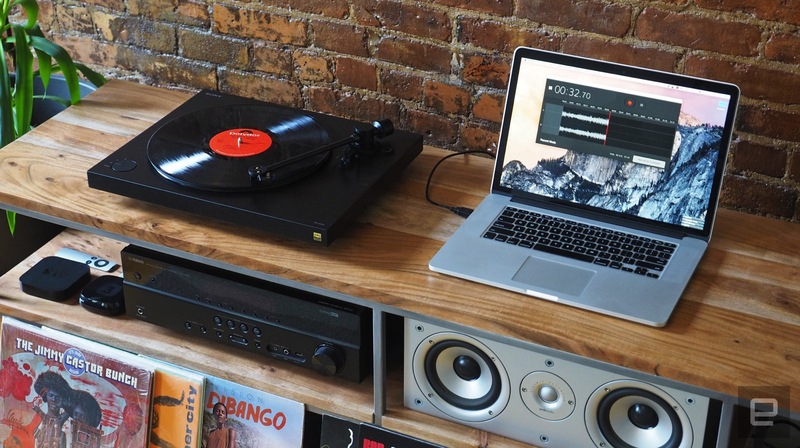 If you want to convert stacks of vinyl to space-saving audio files, this bundle can help. Vinyl has seen a resurgence lately, with sales growth for this format outpacing digital. To stay on top of that trend, Sony refreshed its record player lineup to include the not-so-memorably named PS-HX500. Though it cuts a familiar figure, resembling many minimalist-style turntables, it was built with a 21st century purpose: to make quality digital copies of your treasured discs. That's important for long-time collectors, of course, but also newer vinyl enthusiasts, who will likely want to convert their discs into a high-resolution digital format as painlessly as possible. As record enthusiasts will tell you, the love of vinyl is about the physical product, artwork and warm sound. Even so, this gives you the option of enjoying your tracks beyond just your home-listening zone. Besides, a digital archive is useful as either a backup of your rare records or a gradual transition to virtual media. (It's also the format used by most modern DJs.) At $600, the PS-HX500 costs more than competing players, but the addition of an onboard analog-to-digital converter (ADC) helps justify the premium. In addition, the bundled software, though limited and a tad annoying to use, makes the seemingly endless task of real-time recording easier to stomach. The PS-HX500 is pretty much ready to go right out of the box. You just need to put the platter, belt drive and record mat in place, add the tonearm weight and dial in the antiskate. For output, you can connect to your computer via USB, your stereo system or speaker using RCA (as phono or line-in) or even both at the same time -- which can help you preview if you're recording. 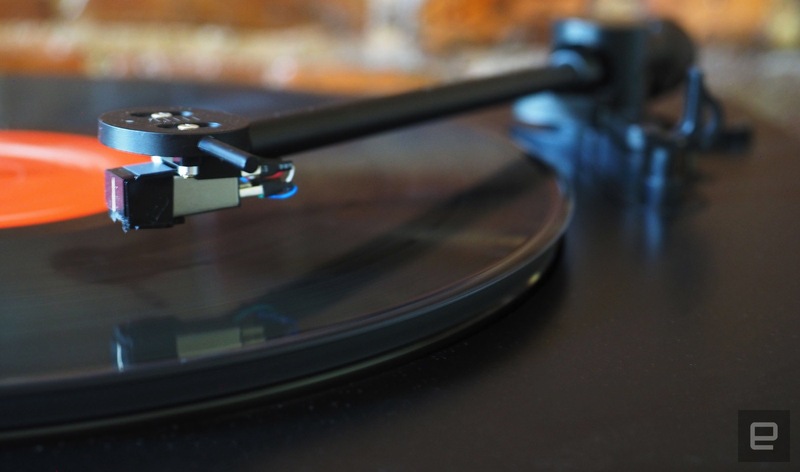 The turntable also comes with a premounted Audio-Technica cartridge with a diamond-tipped stylus, so unless you want to swap in your own, you're good to go there as well. The power and speed controls are bundled together in a single dial on the front left, as you might expect, and can accommodate speeds of 33 and 45 RPM (rotations per minute). If you're into vintage 78s, then, you'll have to look elsewhere. As far as design, there's not much going on here. 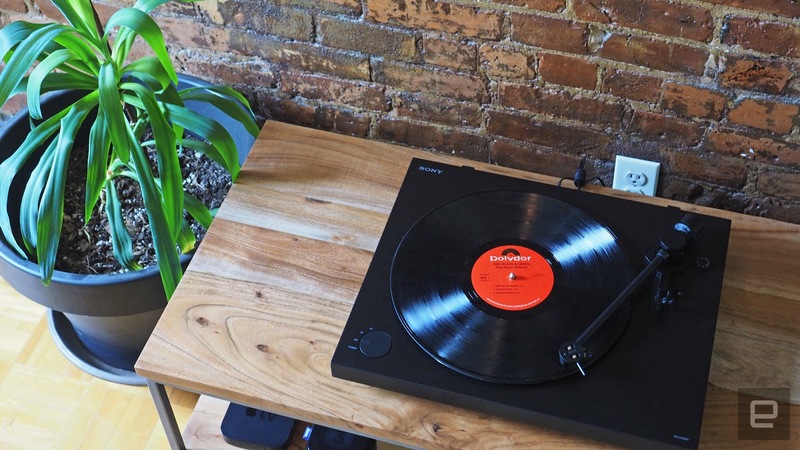 The device looks like most other casual-listening, non-DJ category turntables out there. There's a straight tonearm with a built-in headshell and the base is made from sturdy-feeling composite wood. There's a set of stout little legs with rounded, seemingly gel-filled feet, providing some give to kill unwanted vibrations. As usual, there's also a standard lever for raising the needle off the vinyl without sending it skittering across the platter with your big, clumsy hands. Unless you're looking for high-end audiophile gear, this turntable should meet your expectations, with much of the sound output beyond the needle depending on the system you hook it up to. Really, the most interesting feature is the ability to record records to digital files over USB using the built-in ADC. 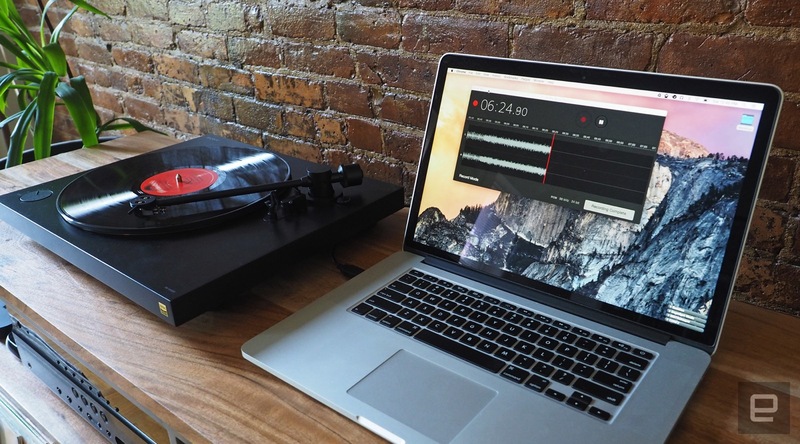 Obviously, you could pick up an external analog-to-digital converter, various turntables and software (like Audacity), but that's more things to include in your setup. For those without the time or knowledge to put together the right elements, the simplicity of this package is appealing. Sony Hi-Res Audio Recorder settings. I have mixed feelings about Sony's Hi-Res Audio Recorder software. On the one hand, it has a simple, uncluttered interface, but that means you won't get much in the way of granular or customizable settings. If you dig in, all you'll find are audio export options and temporary file storage. File types include Sony's Direct Stream Digital (DSD) and PCM. The DSD format is supposed to offer one of the most accurate representations of an analog waveform, but it's only compatible with a limited selection of apps and hardware. Pulse Code Modulation (PCM) is another, more common digital approximation of the original analog waveform and is exported as a WAV file. Because I didn't have any DSD-compatible options on hand, I stuck with the common WAV format for outputting. Once your turntable is connected to a computer via USB, you fire up the (downloadable) app and click the record button to get things started. You won't get any audio monitoring until you do this unless you're playing audio over RCA in addition to USB. It's also worth mentioning that the Hi-Res Audio Recorder software is proprietary and will work only with Sony's turntable. 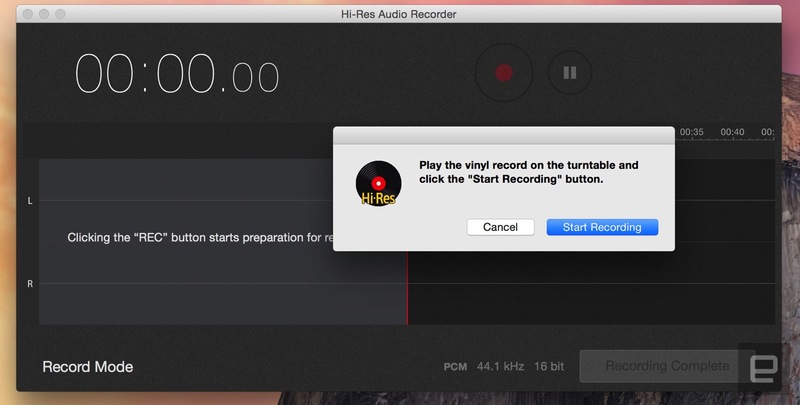 After clicking "record," you'll see a slightly annoying pop-up (one of many, actually) that asks if you're ready to start the recording. The best way to convert a whole record is to let each side play through, pause, flip the disc and continue recording -- up to 100 minutes per file. It's an easy enough task to set markers at the start and end of each track in the waveform, simplifying the exclusion of breaks and pauses from the final export. When you're done with all that, hit the "recording complete" button, then write to files for the final step. Lastly, you'll need to check off which marked sections contain tracks as opposed to blank material to be skipped. All sections are numbered in order, but if you use the "update file names" button at the bottom, it will consecutively number only the items you've selected. 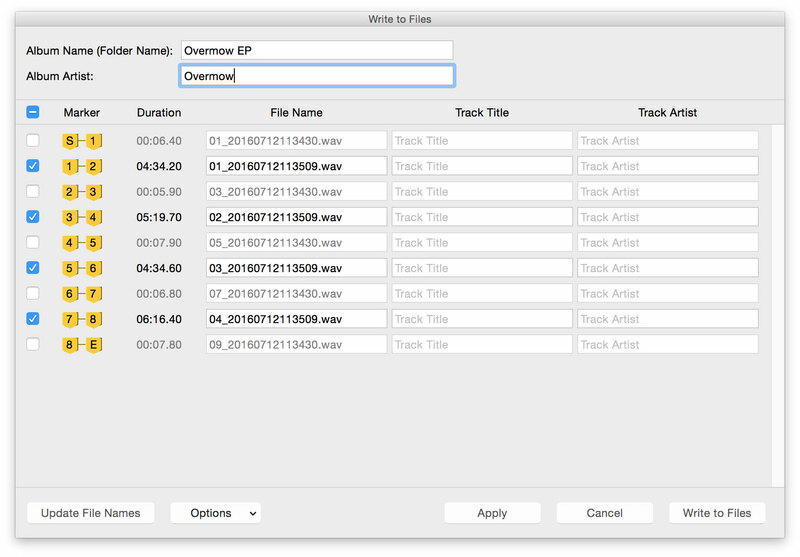 For this reason, it's beneficial to export complete albums in a single file, so the tracks will all be in order. You want to avoid having various duplicately numbered items from multiple exports just lumped in next to each other. The software also lets you apply the album artist field to all the track artist spots to save some data entry. You can also swap out the numeral-only file names with the track titles. Unfortunately, those options are buried in a drop-down menu at the bottom of the window, making the whole process feel a bit convoluted. The weirdness doesn't stop there: When saving files, the dialogue window doesn't show a "new folder" option, but it will save albums as a unique folder or add tracks to an existing match. There are also quite a few secondary pop-ups that hinder your process, stopping you each time, asking for another click to proceed. Keyboard shortcuts are also in short supply. When you're ready to start a new recording, Ctrl+N won't do it; you need to head to the drop-down menu at the top. Ctrl+Z doesn't help you backtrack in various instances, either. Failure to click the apply button after selecting the update file names option will also default to writing tracks as numerals (oddly, without a pop-up to warn you). Argh! Ultimately, though, the recordings sound great (assuming your vinyl is in good nick), but you'll have to wait until the audio files are saved to enjoy them at your selected quality. And if you want to edit out pops and crackles, you'll need additional software. Can you get the same results with a variety of other components? Sure. Both the Rega RP1 and Music Hall MMF 2.2 turntables have a similar style. They're both priced in the $400 to $450 range, but don't include an analog-to-digital converter. Depending on what you're looking for, you can get an ADC for as little as $30 or so. If you're looking to DJ, but want to have a USB output for recording, the Pioneer PLX-500 may be the way to go. If you just want a deck to play tunes and easily make digital high-resolution copies, the Sony PS-HX500 is a tempting option, those few software quirks aside. I found that although I could do all the same stuff (and more) with a multipiece setup, the turntable's compact design, convenient setup and quality recordings make it worth the few extra bucks.